Interstate 495 High Occupancy Toll (HOT) Lanes - Quinn Consulting Services, Inc.
Quinn provided construction management and inspection services on this 14-mile, $1.4 billion Capital Beltway widening project in Northern Virginia from 2008 to 2013. 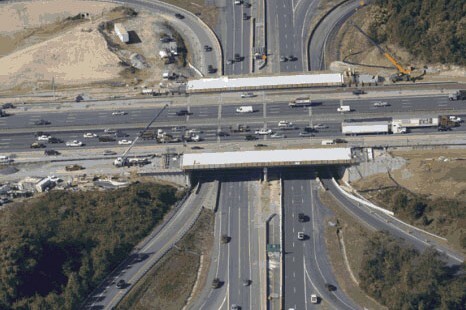 This project added four additional lanes to Interstate 495 that are utilized by high occupancy vehicles (HOV) at no cost or by high occupancy toll vehicles (HOT) who pay a variable toll depending upon traffic conditions. Elements of this massive design-build project included replacing more than 60 bridges and installing more than 70,000 linear feet of new sound walls to protect existing neighborhoods. The project also provided three new access points to the Capital Beltway at Route 29, Westpark Bridge, and Jones Branch Drive. In conjunction with the more than 60 bridges constructed on this project, Quinn personnel inspected all aspects of bridge construction from foundations through superstructures. This project included a variety of bridge types and included existing bridge demolition and replacement. Elements of the bridges varied and included drilled shafts, driven steel piles, structural steel and precast concrete beams, concrete decks, and integral backwalls. Quinn inspectors were also responsible for inspecting the construction of mechanically stabilized earth (MSE) walls, bridge approaches, and parapet walls. When hydraulic cement concrete decks were placed the inspection staff inspected all deck forms and reinforcement and documented contractor “dry-runs” to check deck thickness tolerances and reinforcement cover before concrete placement. During deck placements, inspection staff performed all required concrete tests and monitored evaporation rates, performed wet depth checks, and verified proper concrete curing procedures were performed. While the decks cured, Quinn staff utilized temperature logging devices that had been installed prior to concrete placement and provided a continuous record of concrete temperatures during the seven-day moist curing period. During the pour and again after curing and prior to grooving, Quinn staff straight-edged the decks to make certain they met all specification requirements. In addition, on the structural steel bridges, Quinn provided NACE certified coatings inspectors to monitor ambient conditions, surface preparation, and the painting of structural steel members. The project quality assurance/quality control (QA/QC) procedures were governed by a project specific quality manual with the QC team being responsible for 100 percent of the required inspection and testing. The QC team provided more than 50 professional engineers and inspectors to manage and inspect the Quality Program in Areas 1-4. These engineers and inspectors worked closely with the contractor, designer, and Virginia Department of Transportation (VDOT) representatives to quickly identify and resolve issues before they affected the quality of the project. In addition, to support the efforts of the contractor and the QC team, an on-site laboratory was set up for soils and concrete testing. Field offices were maintained in each area for local coordination and record keeping. The project records system included daily inspection and testing reports, activity specific checklists, approved materials listings, frequency of testing logs, deficiency and non-compliance reports, geotechnical inspections, requests for information, and approved field design changes. On a weekly basis the project records were uploaded on both the project server and a SharePoint system so that owner representatives and other project stakeholders could have instant access to the QA/QC files. Quinn Consulting Services provided construction management and inspection services on the 14-mile, $1.4 billion Capital Beltway widening project. This project added four additional lanes on I-495 that are utilized by high occupancy vehicles (HOV) at no cost or by high occupancy toll vehicles (HOT) who pay a variable toll depending upon traffic conditions. Provided resident engineers and roadway/bridge inspectors. Inspected all aspects of construction from the foundations through the superstructure.